An aerial view shows burned down villages once inhabited by the Rohingya as seen from Myanmar military helicopters that carried the U.N. envoys to northern Rakhine state, Myanmar, May 1, 2018. After months of saying it would bar a U.N. fact finding mission, the decision by the Myanmar government to finally let a U.N. Security Council delegation into northern Rakhine represents a change in approach, although observers recognize that considerable work needs to be done to deal with the deep-rooted issue of Myanmar's treatment of the Rohingya people. The government of Myanmar has come under considerable criticism for its treatment of the Muslim Rohingya, which has led almost 700,000 people — overwhelmingly Rohingya from Rakhine state — to flee to Bangladesh. 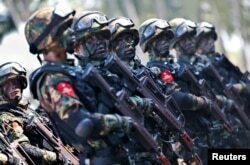 The Myanmar military, with the support of the government, has largely denied committing any wrongdoing during its crackdown in the aftermath of August attacks by fighters from the Arakan Rohingya Salvation Army. The international community has called for an independent investigation, but until now Myanmar had largely been unwilling to play along. 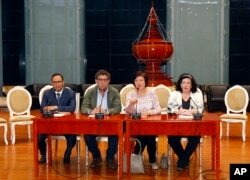 It has said it will deny visas to members of a U.N. fact-finding mission tasked with investigating the human rights situation in the country — with a special focus on Rakhine, but also including Kachin and Shan states — and has also said it will not allow Yanghee Lee, U.N. Special Rapporteur on Myanmar, to enter the country. Members of the Security Council traveled to Myanmar, also known as Burma, last week. They had previously visited Cox’s Bazar in Bangladesh, where the refugees fled to, before going to Naypyitaw to meet senior officials, including State Counsellor Aung San Suu Kyi and Commander-in-chief Senior General Min Aung Hlaing. They were then escorted to northern Rakhine State to visit some of the areas affected by last year’s violence. Speaking at a news conference at the end of the trip, Karen Pierce, the United Kingdom’s representative on the Security Council, continued calls for an independent investigation into the crackdown on the Rohingya. She also refused to rule out the council recommending that Myanmar be referred to the International Criminal Court for its handling of the crisis. U.N. Security Council President Gustavo Meza-Cuadra, center left, Poland's U.N. envoy Joanna Wronecka, center right, Kuwait's U.N. envoy Mansour Ayyad al-Otaibi, left, and Britain's U.N. envoy Karen Pierce, right, hold a press conference at Naypyitaw International Airport in Naypyitaw, Myanmar, May 1, 2018, after a two-day visit to Myanmar. “In order to have accountability, you need a proper investigation with evidentiary standards,” she told reporters, adding that that could be achieved through the ICC, or an investigation conducted by Myanmar. “If there was evidence, then it should be given to the Burmese authorities, and they would undertake a proper investigation,” she said. FILE - Rohingya refugees holding placards await the arrival of a U.N. Security Council team at the Kutupalong Rohingya refugee camp in Kutupalong, Bangladesh, April 29, 2018. Myanmar’s military, known as the Tatmadaw, has already conducted internal investigations into its conduct in Rakhine, and its query found that its personnel were responsible very little wrongdoing, prompting criticism from international observers. “You never relinquish pressure until there’s genuine concession, and you never signal that there’s only two options,” he told VOA, adding that he viewed the Security Council trip as the government doing the “bare minimum” to stave off increased pressure. FILE - Myanmar military troops take part in a military exercise at Ayeyarwaddy delta region in Myanmar, Feb. 3, 2018. “I don’t think there’s any admission or contrition for what happened, and I find that disturbing,” Mathieson said, referring to the military crackdown. The Myanmar government has continued to point to improvements, despite what the rest of the world is observing. After the U.N. visit, Aung San Suu Kyi issued a statement through her office saying that the trip represented a “turning point” in relations between Myanmar and the international community. FILE - Myanmar's leader Aung San Suu Kyi speaks during the signing ceremony of "Nationwide Cease-fire Agreement" at Myanmar International Convention Center in Naypyitaw, Myanmar, Feb. 13, 2018. 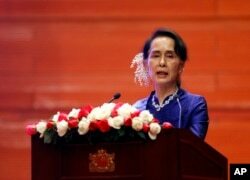 “Violence has no place in a democratic Myanmar. We must work hard to repatriate those who have lost their homes while also dealing with the root causes of the recent violence,” the statement said. FILE - Some Rohingya refugees in Cox's Bazar, Bangladesh, are protesting against the community's repatriation to Myanmar, carrying a festoon on which their demands for repatriation are written. He also rejected claims that military personnel had committed sexual violence during its operation. “No sexual violence happened in the history of Myanmar Tatmadaw,” he said in the statement published on his personal Facebook page. For decades, rights groups around the country have documented sexual abuse at the hands of military personnel. The U.N. Security Council delegation's meeting to many sounds like more of the same condemnation of the Rohingya's treatment, with no specific and no steps announced to addressed it. But observers see Myanmar moving, albeit incrementally, in a direction of change. Nay Yan Oo, a research fellow for the U.S.-based think tank Pacific Forum, said he was encouraged by the trip, and hoped it represented a time of improved relations between Myanmar and the international community, including U.N. agencies. “Myanmar was reluctant at the beginning to invite the international community to get involved in the repatriation of Rohingya refugees,” he told VOA. “However Aung San Suu Kyi has now pledged that her government will work alongside the U.N. for humanitarian assistance and resettlement projects in Rakhine. This is one of the UNSC’s accomplishments in this visit,” he said.